In anatomy, the carina is a ridge of cartilage in the trachea that occurs between the division of the two main bronchi. This occurs at the lower end of the trachea (usually at the level of the 4th thoracic vertebra, which is in line with the sternal angle, but may raise or descend up to two vertebrae higher or lower with breathing). This ridge lies to the left of the midline, and runs antero-posteriorly (front to back). Foreign bodies that fall down the trachea are more likely to enter the right bronchus. Cartilage is a resilient and smooth elastic tissue, a rubber-like padding that covers and protects the ends of long bones at the joints, and is a structural component of the rib cage, the ear, the nose, the bronchial tubes, the intervertebral discs, and many other body components. 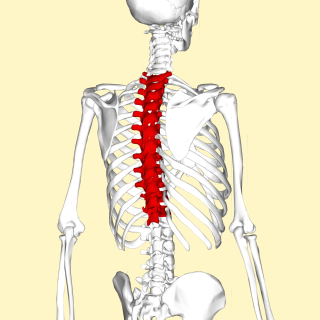 It is not as hard and rigid as bone, but it is much stiffer and much less flexible than muscle. The matrix of cartilage is made up of glycosaminoglycans, proteoglycans,collagen fibers and, sometimes, elastin. The mucous membrane of the carina is the most sensitive area of the trachea and larynx for triggering a cough reflex. Widening and distortion of the carina is a serious sign because it usually indicates carcinoma of the lymph nodes around the region where the trachea divides. Carcinoma is a category of types of cancer that develop from epithelial cells. Specifically, a carcinoma is a cancer that begins in a tissue that lines the inner or outer surfaces of the body, and that arises from cells originating in the endodermal, mesodermal or ectodermal germ layer during embryogenesis. Tracheobronchial injury (TBI) is damage to the tracheobronchial tree. It can result from blunt or penetrating trauma to the neck or chest, inhalation of harmful fumes or smoke, or aspiration of liquids or objects. In vertebrate anatomy, the throat is the front part of the neck, positioned in front of the vertebra. It contains the pharynx and larynx. An important section of it is the epiglottis, which is a flap separating the esophagus from the trachea (windpipe) preventing food and drink being inhaled into the lungs. The throat contains various blood vessels, pharyngeal muscles, the nasopharyngeal tonsil, the tonsils, the palatine uvula, the trachea, the esophagus, and the vocal cords. Mammal throats consist of two bones, the hyoid bone and the clavicle. The "throat" is sometimes thought to be synonymous for the isthmus of the fauces. Esophageal atresia is a congenital medical condition that affects the alimentary tract. It causes the esophagus to end in a blind-ended pouch rather than connecting normally to the stomach. It comprises a variety of congenital anatomic defects that are caused by an abnormal embryological development of the esophagus. It is characterized anatomically by a congenital obstruction of the esophagus with interruption of the continuity of the esophageal wall. Tracheitis is an inflammation of the trachea. Although the trachea is usually considered part of the lower respiratory tract, in ICD-10 tracheitis is classified under "acute upper respiratory infections". Terminologia Anatomica (TA) is the international standard on human anatomic terminology. It was developed by the Federative Committee on Anatomical Terminology (FCAT) and the International Federation of Associations of Anatomists (IFAA) and was released in 1998. It supersedes the previous standard, Nomina Anatomica. Terminologia Anatomica contains terminology for about 7500 human gross (macroscopic) anatomical structures. In April 2011, Terminologia Anatomica was published online by the Federative International Programme on Anatomical Terminologies (FIPAT), the successor of FCAT. The cough reflex has both sensory (afferent) mainly via the vagus nerve and motor (efferent) components. 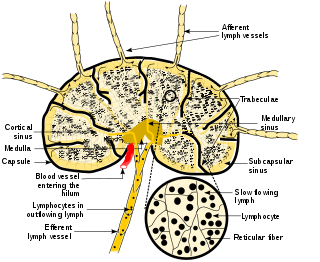 Pulmonary irritant receptors in the epithelium of the respiratory tract are sensitive to both mechanical and chemical stimuli. The bronchi and trachea are so sensitive to light touch that slight amounts of foreign matter or other causes of irritation initiate the cough reflex. The larynx and carina are especially sensitive. 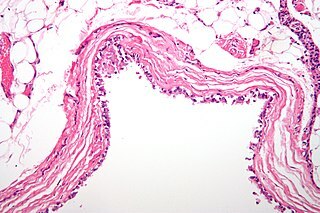 Terminal bronchioles and even the alveoli are sensitive to chemical stimuli such as sulfur dioxide gas or chlorine gas. Rapidly moving air usually carries with it any foreign matter that is present in the bronchi or trachea. Stimulation of the cough receptors by dust or other foreign particles produces a cough, which is necessary to remove the foreign material from the respiratory tract before it reaches the lungs. A bronchopulmonary segment is a portion of lung supplied by a specific tertiary bronchus and arteries. These arteries branch from the pulmonary and bronchial arteries, and run together through the center of the segment. Veins and lymphatic vessels drain along the edges of the segment. The segments are separated from each other by layers of connective tissue. Each bronchopulmonary segment is a discrete anatomical and functional unit, and this separation means that a bronchopulmonary segment can be surgically removed without affecting the function of the others. The tracheobronchial lymph nodes are lymp nodes that are located around the division of trachea and main bronchi. Bronchoscopy is an endoscopic technique of visualizing the inside of the airways for diagnostic and therapeutic purposes. An instrument (bronchoscope) is inserted into the airways, usually through the nose or mouth, or occasionally through a tracheostomy. This allows the practitioner to examine the patient's airways for abnormalities such as foreign bodies, bleeding, tumors, or inflammation. Specimens may be taken from inside the lungs. The construction of bronchoscopes ranges from rigid metal tubes with attached lighting devices to flexible optical fiber instruments with realtime video equipment. Spindle cell sarcoma is a type of connective tissue cancer in which the cells are spindle-shaped when examined under a microscope. The tumors generally begin in layers of connective tissue such as that under the skin, between muscles, and surrounding organs, and will generally start as a small lump with inflammation that grows. At first the lump will be self-contained as the tumor exists in its stage 1 state, and will not necessarily expand beyond its encapsulated form. However, it may develop cancerous processes that can only be detected through microscopic examination. As such, at this level the tumor is usually treated by excision that includes wide margins of healthy-looking tissue, followed by thorough biopsy and additional excision if necessary. The prognosis for a stage 1 tumor excision is usually fairly positive, but if the tumors progress to levels 2 and 3, prognosis is worse because tumor cells have likely spread to other locations. These locations can either be nearby tissues or system-wide locations that include the lungs, kidneys, and liver. In these cases prognosis is grim and chemotherapy and radiation are the only methods of controlling the cancer. A mediastinoscope is a thin, tube-like instrument used to examine the tissues and lymph nodes in the area between the lungs (mediastinum) in a procedure known as mediastinoscopy. These tissues include the heart and its large blood vessels, trachea, esophagus, and bronchi. The mediastinoscope has a light and a lens for viewing and may also have a tool to remove tissue. It is inserted into the chest through a cut above the breastbone. Bronchogenic cysts are small, solitary cysts or sinuses, most typically located in the region of the suprasternal notch or behind the manubrium. 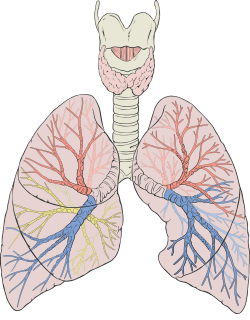 The Intrapulmonary nodes or Lymphatic Vessels of the Lungs originate in two plexuses, a superficial and a deep. The superficial plexus is placed beneath the pulmonary pleura. The deep accompanies the branches of the pulmonary vessels and the ramifications of the bronchi. In the case of the larger bronchi the deep plexus consists of two net-works—one, submucous, beneath the mucous membrane, and another, peribronchial, outside the walls of the bronchi. 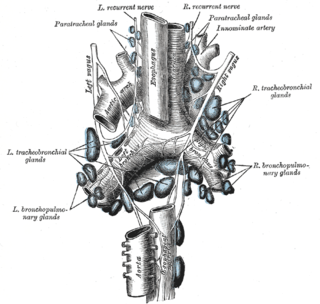 In the smaller bronchi there is but a single plexus, which extends as far as the bronchioles, but fails to reach the alveoli, in the walls of which there are no traces of lymphatic vessels. The superficial efferents turn around the borders of the lungs and the margins of their fissures, and converge to end in some glands situated at the hilus; the deep efferents are conducted to the hilus along the pulmonary vessels and bronchi, and end in the tracheobronchial lymph nodes. Little or no anastomosis occurs between the superficial and deep lymphatics of the lungs, except in the region of the hilus. Tracheobronchopathia osteochondroplastica (TO) is a rare benign disease of unknown cause, in which multiple cartilaginous or bony submucosal nodules project into the trachea and proximal bronchi. The nodules usually spare the posterior wall of the airway because they are of cartilaginous origin, while the posterior wall of the airway is membranous. This is as opposed to tracheobronchial amyloidosis, which does not spare the posterior wall. ↑ Chu CP, Chen PP (April 2002). "Tracheobronchial injury secondary to blunt chest trauma: Diagnosis and management". Anaesth Intensive Care. 30 (2): 145–52. PMID 12002920. Look up carina in Wiktionary, the free dictionary. This article incorporates public domain material from the U.S. National Cancer Institute document "Dictionary of Cancer Terms" . The National Cancer Institute (NCI) is part of the National Institutes of Health (NIH), which is one of eleven agencies that are part of the U.S. Department of Health and Human Services. The NCI coordinates the United States National Cancer Program and conducts and supports research, training, health information dissemination, and other activities related to the causes, prevention, diagnosis, and treatment of cancer; the supportive care of cancer patients and their families; and cancer survivorship.